I was going for a dramatic sounding title…like a soap opera “Days of our lives” or something. So hopefully that came accross. I’ll start working on a sound app or something. Anyway….This week we’ve had a burst in sunshine for that last bit of summer. Which was really nice, because we know that I love the sun. Ellie started school, which she was excited about. She has already lost a new coat. We’re hoping she finds it today, because of course I hadn’t wrote her name in her new coats yet. On the house front, I’ve been reading everyone’s advice on last weeks Inspiration: Exterior post. And I’m still really undecided. 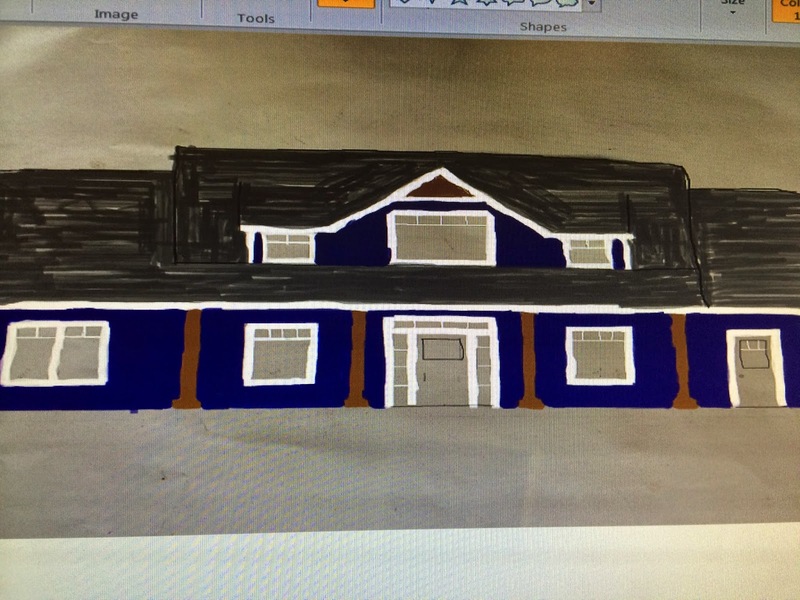 So I decided to use my art skills and color an exterior photo and see what that looks like. I know, you are blown away by my coloring skills. I just had a .jpeg of the exterior and opened it in Microsoft Paint. Some bloggers I follow are really fancy and have photoshop programs and others. Well you aren’t gonna get that here. I’m pretty sure if you compared this with one of Peyton’s drawings, you may not be able to tell them apart. But it gets you an “idea” of what the exterior might look like. This blue is a shade brighter than what I’m thinking. But I couldn’t get it just right with the color choices in paint. So imagine with me. Sue said it looks like a Seahwaks house. So I am still considering a dark grey. I found a new color called Perfectly Greige. I’m considering. But my eyes always wonder back to the Navy’s/Blue. Ugh, decisions. 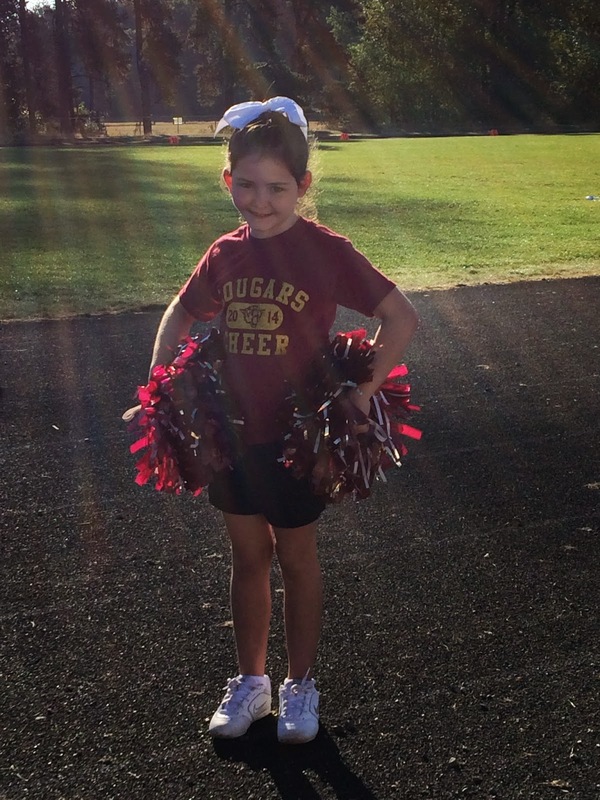 Ellie had her first cheer games Saturday. It was a bit long. The first game was at 9, then the second at noon. The girls were done by the second game, there were no firm motions, arms were just flailing. Also, it was hot for WA. Now try not to be too judgey here, but I ran my kids to McD’s before the second game to get some food in them. I pull up to order their happy meals, and both of them start yelling at me from the back telling me HOW to order their meals. People, this is not my first time through the drive-thru. I’ve ordered them more happy meals than I’d like to admit. I got this OK. Why my kids think I have no clue on how to order their meals baffles me. And to top it off, I got the soft spoken employee who I can hardly hear. So, you probably see where this is going, I have to turn and yell at my kids to stop telling me how to order their meals…in my mom voice. Then I turn back to the screen saying THANK YOU. Yeah, his face was pretty classic when I got to the window. We had a fun family night Saturday night. Ron and Sue were gone, so we had the house to ourselves. Karlye and Josh brought steaks over and we grilled them up for dinner. I had gone to the store earlier in the day and bought some Sangria. The evening then turned into beauty shop, Karley began making my hair into an afro and Ellie put a bunch of braids in Karlye’s hair. Then the kids went to sleep. We drank some more sangria and somehow Karlye began chasing Josh around the island with the mop, then he grabbed the broom. It was more funny if you were halfway into a bottle of sangria. We then made chocolate chip cookies at 9pm, cuz it sounded really good. And we ate the dough. These are the times I really like living with so much family. Its always entertaining. Today Kyle is meeting with the TRUSS guy. Hopefully its all put together. If there is any luck at all, we can put our whole package together and submit it to the county by the end of the week. My fear is, after talking to others, is that this building permit approval thing is going to take fooorreevvveerrrrr (insert dramatic tone). One person told me it took them a year to get it all approved to begin building! I will have a total freak out if that happens. I’m realistic, I know it will not take a week, but after a month or so I expect something. So I”m sure my next several posts will be all about the waiting. At least in the meantime kyle can keep clearing and begin installing the septic system. To end the post. 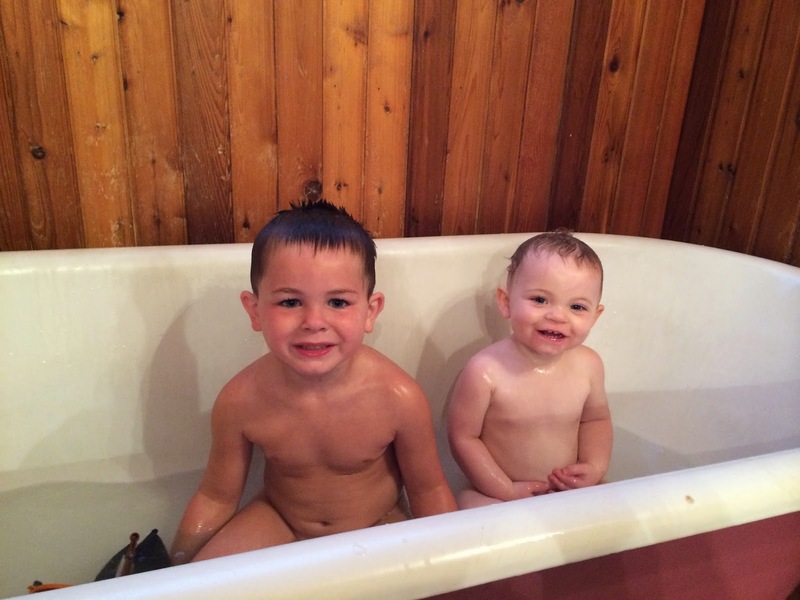 Here’s a cute picture of Peyton and Bailey cuz who doesn’t love babies in baths. Girl, I can't tell you how many times I've tried to make decorating decisions in Paint…you are not alone! How did the gray look? @lot 411 You'll see a pic in tomorrows post with the “Greige” paint. The dark gray was too dark…I”m sure that has nothing to do with the paint program 🙂 I”m now testing a light grey. But I am liking the Greige. Stay tuned! I have commitment issues, and the blue is tempting…but like I wanna wear red pumps tempting but not every day. So still on the fence.